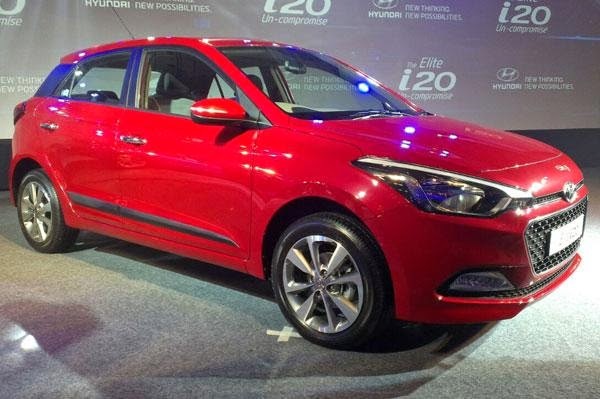 Hyundai has launched the new Elite i20 in both petrol and diesel guise. The petrol variant gets an 81bhp 1.2-litre Kappa2 engine, while the diesel gets an 89bhp 1.4-litre U2 CRDi engine. Both engines come with five-speed manual transmission. There are four trims – Era, Magna, Sportz and Asta, with the Sportz also getting an options package – Sportz (O). The Era trim gets features like electric power steering, day and night rearview mirror, body-coloured front bumper, dual tone rear bumper, two-tone interiors and a 12V power outlet. Over the Era, the Magna gets foldable key, body-coloured exterior mirrors and handles, rear parcel tray, front centre armrest, 2-DIN audio system with 1GB memory, USB and Bluetooth connectivity, steering-mounted audio controls, rear power windows, rear AC vents, cooled glovebox and electrically-adjustable wing mirrors. The higher-specced Sportz trim adds ABS, driver airbag, reverse parking sensors with rear camera, front fog lamps, impact-sensing auto door unlock, rear defogger with timer function, front seatbelt pretensioners, turn indicators on wing mirrors, leather-wrapped steering and gearknob, height-adjustable driver’s seat, CD player, climate control, rake and reach adjust for steering, electric and auto folding wing mirrors over the Magna. The options pack, Sportz (O), adds smart key, diamond-cut alloys and push button start-stop to the Sportz trim. Over and above all these features, the top-end Asta trim gets a front passenger airbag, automatic headlamps, rear seat that can be split 60:40, adjustable rear headrests, second 12V power outlet and rear wiper with washer.